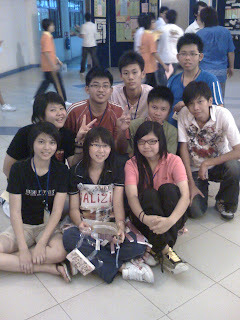 living sweet memories n '记号' (taught by Miss Teo)..
i met one of the leo club of southern college committee with the name YEE LEONG..
he came all the way up to muar to bring us down to jb..
he help me to carry my bag all the way to southern college.. ^^ thx kor kor..
i met a guy called JASMEN..
my fren said tat he is my brother as our name so alike..
he's also funny n easy going person..
he also quite caring n helpful..
he'll help whenever u have a prob..
i get to know a gal called MEI LIN..
she's my leader (SOCIALIZING GROUP) n she's funny n easy going person..
she take really good care on me..
during station activity.. my feet (as usual) very lembek..
she's so nice until i feel crying when we gonna go back to our hometown..
n her assistant is called zuo you 卓宥..
he too a funny person..
he imitate nancy n auntie automatic..
seriously his acting really amaze me... so funny..
next up is IVY.. we call her bing shan mei ren 冰山美人..
she's very cool tat where she got tat nickname..
her eyes is so pretty n big..
until i feel so zhi bei..
then there is a guy called himself tian 天..
dunno his real name though..
he talks a lot n he is a good spy..
i play a lot with him n chatting wu liao stuff..
kicking , laughing here n there.. funny though..
sry ya i make u fall down..
i told u i wanna make u fall down..
i tot u r playing.. mana tau betul betul jatuh pulak..
there's other member in our group..
namely wai shi, xiao chao (小草), ah boon, n the other 2 guy i dunno wat the called..
i met mei lin's fren.. called HONG WEN (鸿文)..
he got a bit weird weird..
he call me from my back n when i turn he only say 'hi'..
dunno wanna angry or laugh.. funny person..
he is a nice fren though..
when i saw his caringness towards mei lin..
he persuade mei lin when she's down.. i feel very touch..
1st time on earth got a person ask me "can i bully u?".. 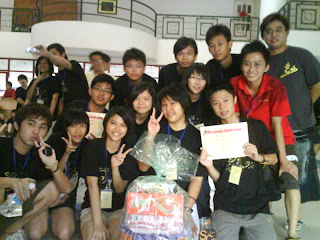 n his the one.. one n only cute ppl..
although tired n aching here n there..
but meeting them really very sweet..
our prize "zui jia tuan tui"
result : i found nothing!!! got so maniac ppl stealing inside shirt ?? to those who live in sg abong..
1st time on my life i went to WU..
tot it was really fun..
it was damn hot in the afternoon..
make me dun wanna stay for the closing ceremony..
jux wasting my 2 hour ++ time there..
Qi, dun sad sad o..
i kno u done ur best ady...gambateh..
keep dreaming bout u... make me feel im so 'hua chi'..
i really cant think of anything to make me forget to think bout u..
ai yo yo.. wat happen to me? tis year is SPM year.. i should study for my exam..
actually im not angry of that activity although we did it almost every year..
the most STUPIAK thing is that our KETUA dunno how to find station..
she tot all of us so energetic like her izzit? that stupiak running stuff make my stomach so pain..